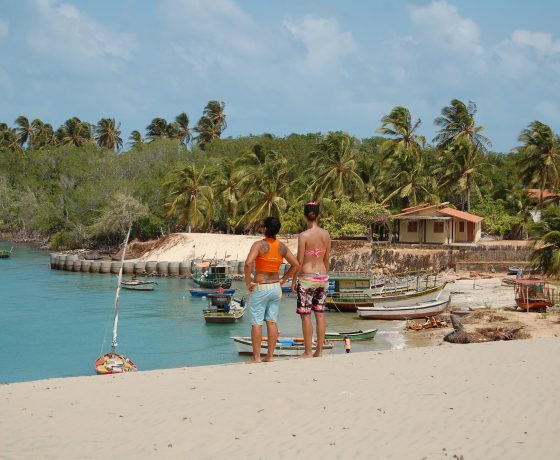 During this all in trip, we will stay at & visit the well-known fisherman town called Cumbuco. And during the kitesafari from the port of Pecem up to Macapa we will take care of nice and clean pousadas to stay, go to the the accommodation and safari tab to check it out. 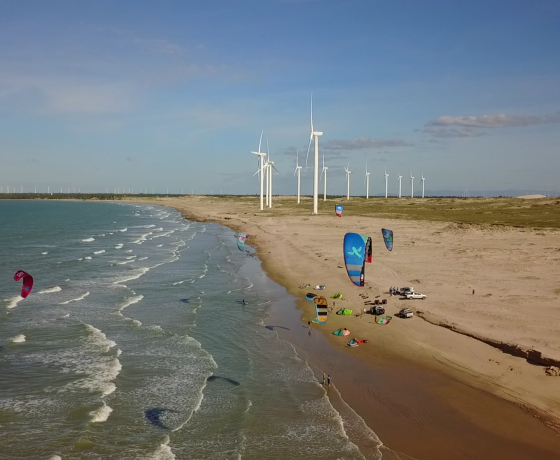 This trip is for riders who know how to ride upwind, want to learn better kitesurfing and for those who want to improve their tricks or techniques. 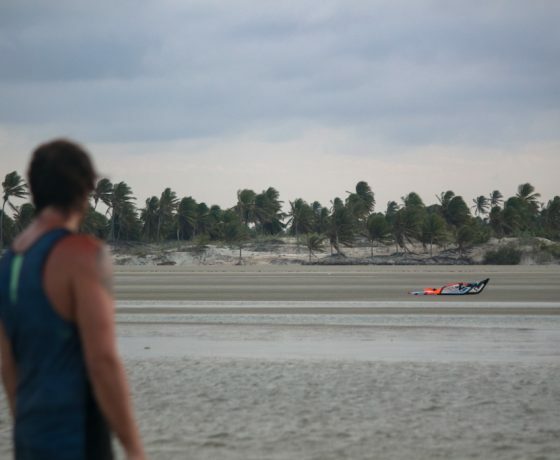 With help of downwinders, clinics and many different spots at kitesurf paradise Brazil. 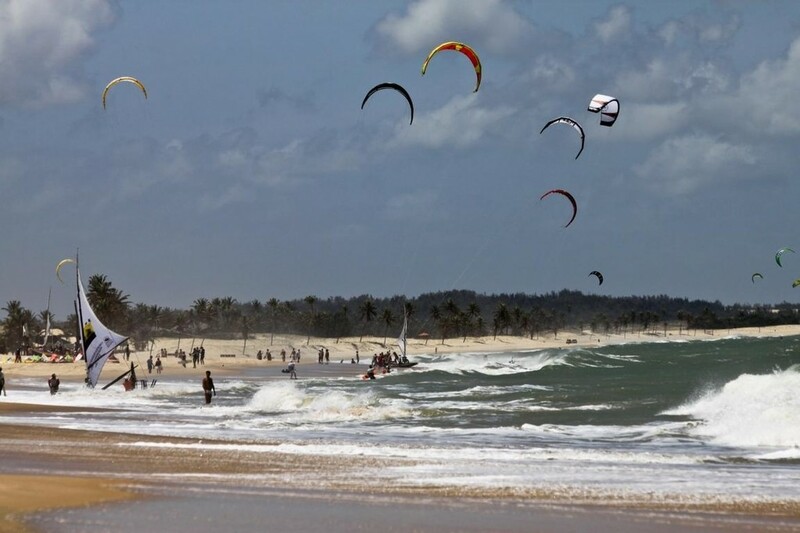 Brazil is well known for perfect kite conditions with palm fringed beaches, an average air temperature of 30 degrees and water temperature of 24 degrees. 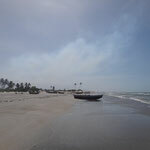 After cumbuco we will move forward with our famous kite safari, why do we call it a kitesafari instead of downwind safari? That’s because we offer a unique experience for all levels! Are you ready for nice downwinders? Go for it! 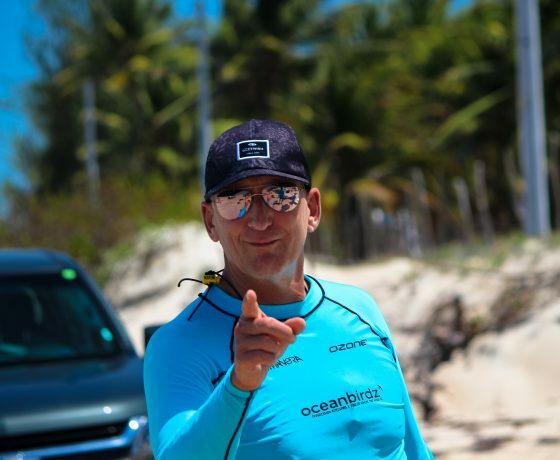 We will separate the advanced kiteboarders in a car so you can kite a big part of the way downwind, and of course we will guide you on the water trough it. Nearly able to ride upwind? No problem, we will take you closer to the spot of that day, so you don’t have to downwind that far. 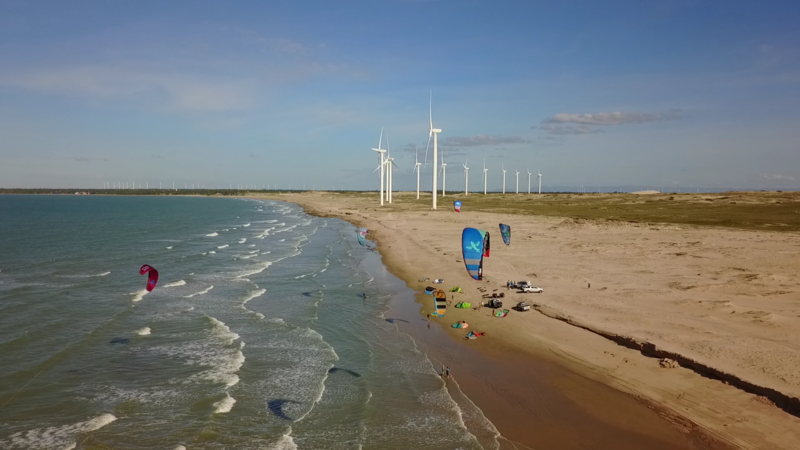 So our kitesafari is for all levels, the only thing we expect is kitecontrol and some upwind riding, as we are not able to teach total beginners during the kitesafari. 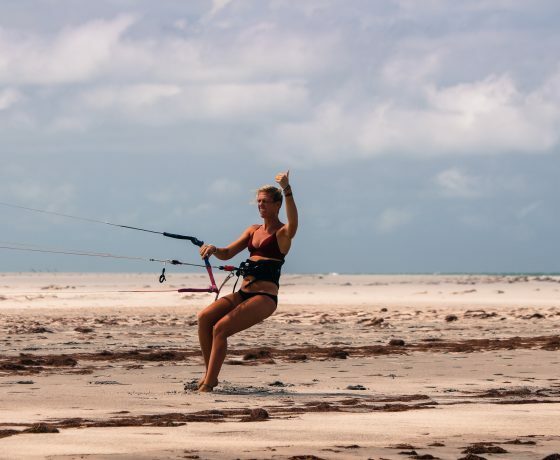 Although downwind traveling is a cool experience, we do believe it’s even nicer to do loads of spot kiting at different breath taking places and take the time to discover all the spot has to offer, therefore we spend mainly 2nights per stop. Check all details at the kitesafari tab. 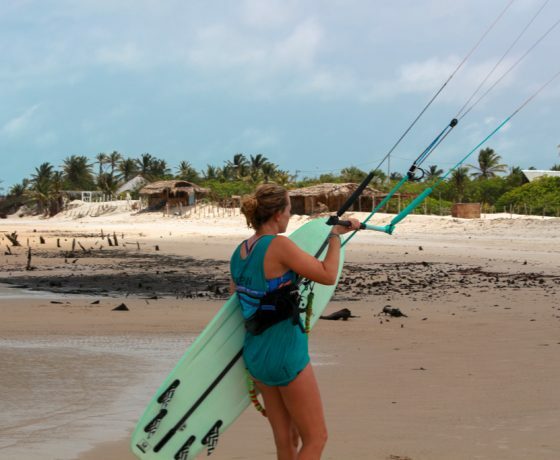 Kitesurfing in your bikini / boardshorts, discover the real beauty of the Brazilian coastline, fisherman villages, lots of sun, luxurious accommodations, a group of kite addicts around you and an every day wind forecast. It’s all there! Welcome to Oceanbirdz in Brazil. As we would like to offer quality, we only have 10! places available. The trips are planned during october and november as this is the high season at Brasil. Questions? Just send us an email via hello@oceanbirdz.com. At the very least, you shouldn’t miss the Oceanbirdz Kitesafari! Villa Coquerios is a small-scale hotel with a beachbar located directly on the beach of Cumbuco. All rooms are spacious and come with an en-suite bathroom with a hot shower, comfortable beds and an outside space with a hammock. Including breakfast, WIFI, kite parking and daily housekeeping. You will be sharing your room with a maximum of one other guest. When walking into the hotel area you will have a tropical feel where you can completely switch off and fall asleep to the sounds of the Altantic ocean. With the beach just on our door step, there is created a space where you can kick back, relax and enjoy every minute of this tropical paradise with a large terrace, good bar and refreshing pool. 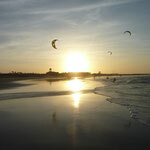 During the kite safari we will stay over at luxe spacious and mainly beachfront pousada’s and familiar hotels. Oceanbirdz always provides good and clean accommodation with a cozy atmosphere and room will be shared with a maximum of 1 other traveller. During our last nights we will be staying in Barrinha and if you would like to stay longer you can join us the rest of your stay at Cumbuco again. Flights are not included, but for sure we can help you out with it! Check TAP and KLM for the best offers. You can book your own flight from the airport of your choosing. Please keep in mind we include transfer on the arrival and departure date, if you decide to arrive on a different date, we need to charge a private transfer. * From anywhere in Europe, TAP has daily flights via Lisbon to Fortaleza. Info: www.flytap.com. * From Milan, Air Italy has weekly direct flights to Fortaleza. Info: www.airitaly.it. * TAM flies from Miami, Paris, Buenos Aires, Rio de Janeiro and São Paulo and Madrid. Info: www.tam.com.br. * Kitesurf intermediate course 4×2 hours for €350. * Kitesurf private trick lesson: €45/hr. 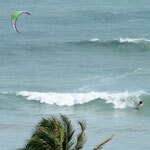 * Kitesurf equipment rental, ask for options. It’s not a problem if you come alone. You will be sharing a room with the maximum of one other travelers (we always try a traveler from the same gender). We need 6 travelers per group to make this trip happen. During this trip we’ll start our stay in a little village called Cumbuco. The hotel’s location is perfect: it’s located on the beach, within walking distance to the center of Cumbuco, where you can find various shops and a range of local and international restaurants. 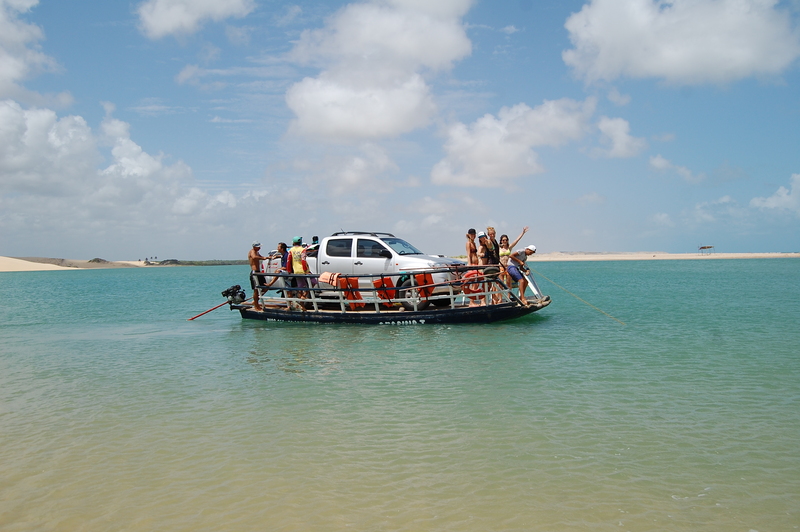 The Fortaleza airport is only 30 kilometers away and we will pick you up upon arrival. 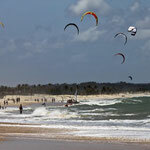 Cumbuco is a remote fishermen’s village in the northeast of Brazil and has perfect kitesurfing conditions. Just like most Brazilian villages, Cumbuco’s small and cozy center is located around the main square. In the last few years, Cumbuco has become a beloved holiday destination for Brazilians as well as foreign tourists. It’s only crowded around New Year. The rest of the time you’ll find a laidback and tranquil setting. Cumbuco has a beautiful and quiet beach on one side of town and an amazing landscape of looming sand dunes on the other side. Behind the dunes you have astonishing mountains with waterfalls and tropical vegetation. Fortaleza is the fifth largest city in Brazil with a population of almost 3 million and is about 30K away. Close enough to thrill and far enough to chill! 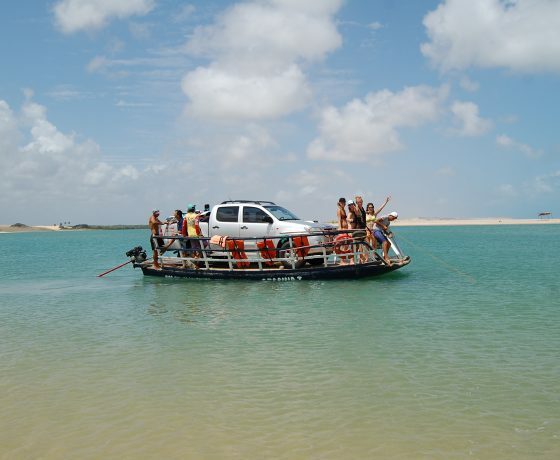 After Cumbuco we will take you in our 4X4 cars and go on Oceanbirdz kitesafari! Icaraizinho, in the Ceará state. It’s a small and calm village, with a great variety of spots and kite conditions on the way: plain water up to small waves and big clean breaking waves from around 1.5 – 2.5 metres in height. 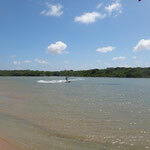 Everything a rider’s heart desires ; between Paracuru and Icaraizinho we organize a nice downwinder of 20km. Along the way flat and waves alternate, but the waves we encounter are long and good to ride for each level. 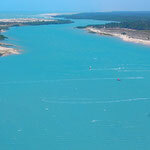 On the spots around (paracuru / taiba); you will find the legendary flat water and wave spot all in one. After full days of kiting there is time for eating freshly grilled fish, relaxing with caipis, watching sunsets and taking a well deserved shower. In the afternoon of our first safari day we reach Moitas. Here it seems as if time has stood still. Surrounded by a cozy atmosphere, freshly grilled fish and a cold caipi you experience the ‘I never want to leave’ again. And that’s exactly why we stay one extra day to kite on this beautiful spot! 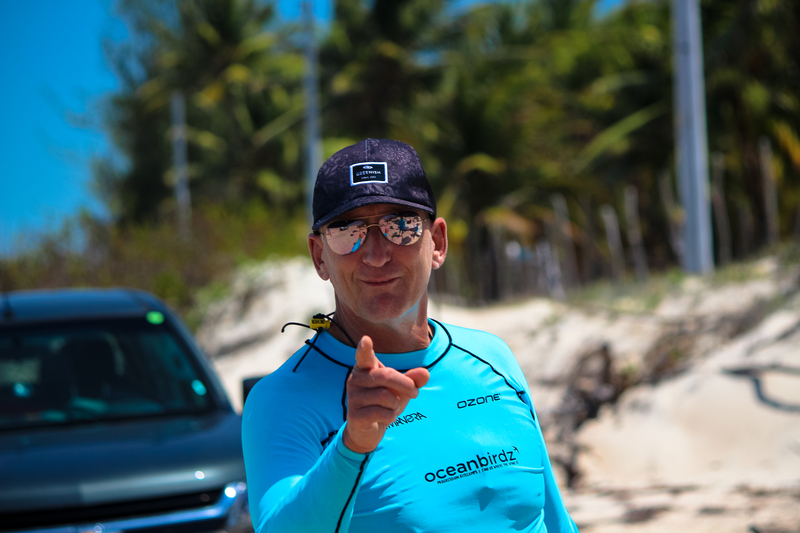 After an extra day with small downwinders and coaching in front of the door we will continue to drive or ride to Ilha do guajiru. Ilha do Guajiru, a small village existing of a bunch of pousada’s on a row at a big lagoon where you can ride till the sun goes down. After ilha we show you the beauty of the deserted Brazilian coast line when we start the drive to our next stop. But not before we made the most flat downwinder ever! We will ride trough a river, it’s a true experience; the Almofala downwinder. On day 8 the longest downwinder of the entire program is planned. Do not worry, you may, you do not have to go;) Can you handle it? Go for it! together with our crew, 70km along the coast to Barrinha? we are happy to accompany you. 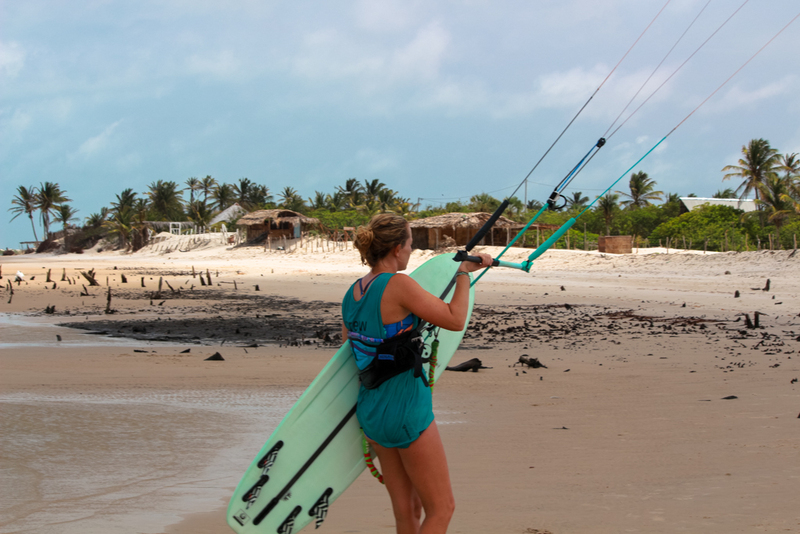 During our downwinder we encounter small fishing villages, beautiful deserted beaches lined with palm trees and reach the beautiful abandoned Barrinha under our kites. A bit to much or more fan of on the spot kiting? Then our cars will take you to Barrinha, here you can ride and accompany the last 5km along downwind to Prea / Jeri. Where we end the day together with a cold beer to continue to our next place to sleep: Maceio. In 1994 the coast of this village was declared one of the 10 most beautiful beaches in the world and once here its clear why! 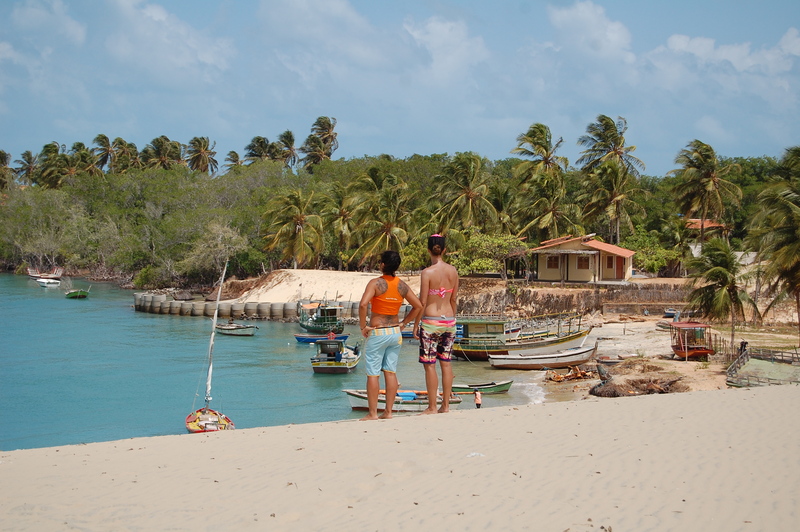 Maceio is a true paradise, surrounded by sand dunes and only sandy paths as usual roads in this small town. The people are friendly and you can see that everything is built up with love. During the evening we will climb the sand dunes to enjoy a beautiful sunset, perhaps the most beautiful you have ever seen! We stay 2 nights in Maceio, before we go just a bit further north. We will start our day with a drive or downwinder to get further up to the north. After passing the river with a boat we will proceed to Macapa. We pass little fishing villages, beautiful sandy beaches lined with coconut trees and reach Macapa while the last hours of sun will give us a golden hour session to end the day.. Here we stay at a sweet pousada and an ice-cold beer or cocktail will be waiting for us. 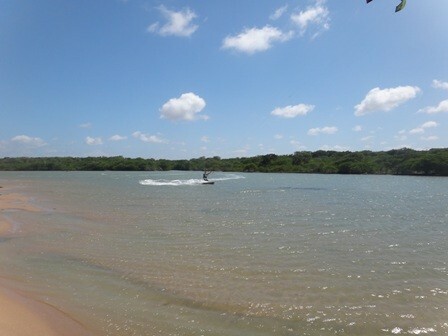 Macapa is in Piauí and is one of the best flat spots of Brazil! It’s a small village near Barra Grande. As we dont want you to choose between riding the lagoon, hit the waves, go trough the mangroves or make another downwinder, we will offer you all and stay over for 3 nights! The way from Macapa back to Fortaleza is a long one and therefore we split the trip by spending 2 nights in Barrinha. Here we will prepare a last downwinder, which is perfect to try it for the first time or ride a waveboard if you didn’t before, after the spot search en rides in the surrounding it’s time to spend a night in Jeri! The must see surf village of the region. The last day you can do another goodbye session, pack your bags, relax in hammocks, enjoy delicious food at our campfire under the stars and after… unfortunately get ready to head back to Europe. 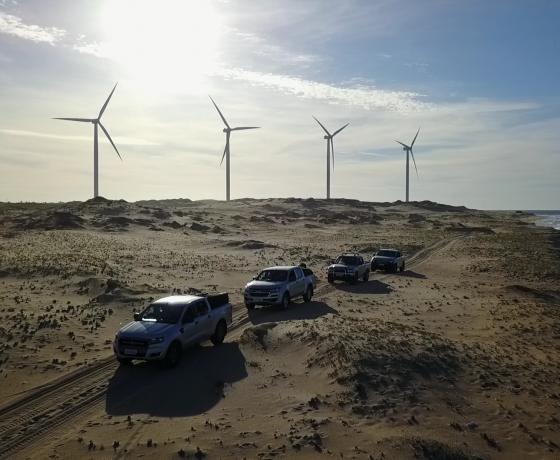 We use Hilux (4×4) and our Defender to drive over beaches and roads with you. Every traveller has her/his own seat in the Hilux and there is a maximum of 4 per car. If we drive over the beach, we will have a lot of sightseeing and adventure (for example to cross rivers by little ferrys). 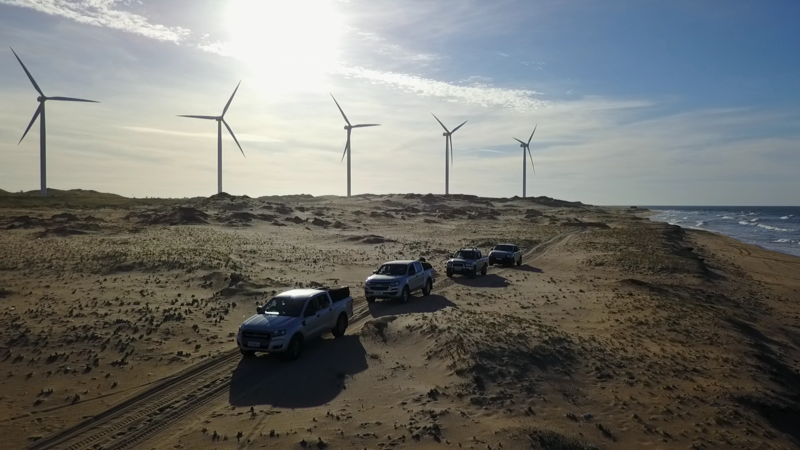 The Hilux will be with you all the time while you’re kiting. Our drivers speak dutch, german, french, english and portugese. 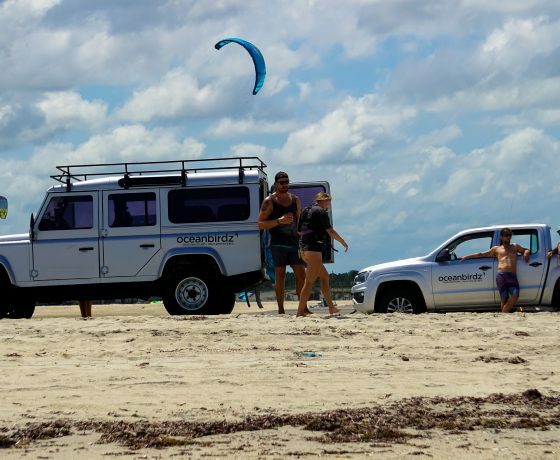 They are very professional and of course experienced kiters. Additionally most are certified IKO Kite teacher and would love to help you learn and show some tricks. Coaching is always included in our trips. 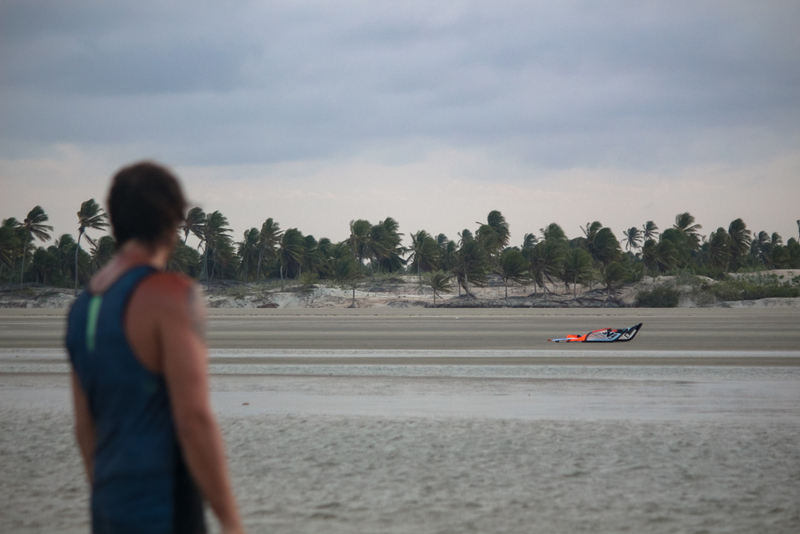 It might be clear, this trip is all about downwinding and kitesurf down the coastline of Brazil. We will organise small, nice and easy downwinders for all levels. The car will be always on the beach, to provide assistance. 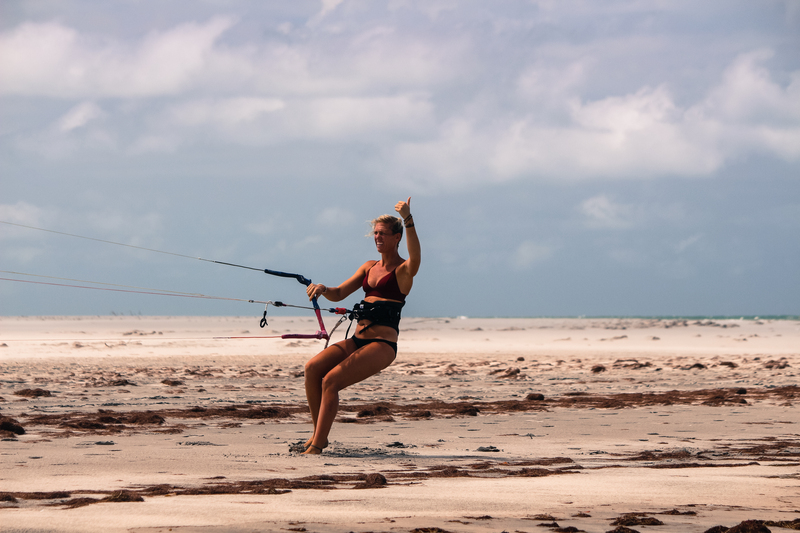 We know the coast and know the nicer parts for downwinding and the best kitespots on the way! Ready for the real work; long downwinder to the next spot? Be our guest and join the Oceanbirdz crew on the water. Or, you want to learn downwind riding and practise your tricks on the lagoons? No worries, our cars will take you to the next spot. Big, healthy breakfast will be included daily during the whole trip. Out of experience we know it’s better to have a big breakfast (in the price included) which gives energy for the day, instead of an extra long lunch. 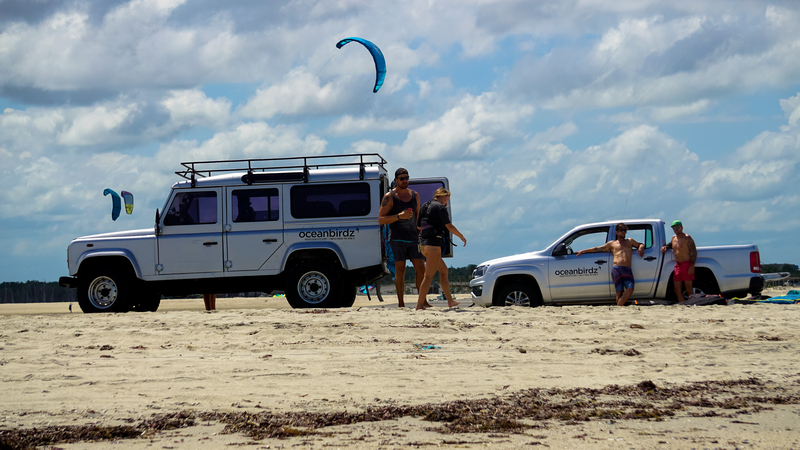 While kitesurfing it’s not nice to have a full stuffed belly, therefore we will always have water, bananas, fruits, cookies and little lunch snacks in the car for during the day (included) and at night we go for an early diner. We include main dish and one drink every evening during the kitesafari. Sometimes we will have diner in the pousadas and other evenings we will take you out for diner in to the small villages. In Barrinha we will treat you with a nice farewell bbq and at Jeri we give you the freedom to go out by yourself, as there are so many nice places. At Barrinha we organise a nice goodby BBQ and little farewell beachfire. And the next day, you can stay in the pousada, relax, kite again, prep your bags.. wathever you want, until we will pick you up for the airport transfer.